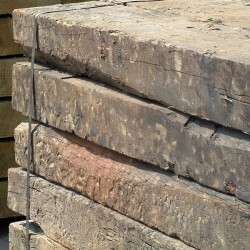 Landsacping Railway Sleepers are perfect for a variety of uses including retaining walls, driveway edging. We have four varieties of sleeper in stock, New Oak Sleepers, Softwood Tanalised both Brown & Green plus Grade 1 Reclaimed railway sleepers. Perfect for a variety of uses including retaining walls, driveway edging etc.It is worthy of note th.. These New Oak Hardwood Sleepers are ideal for landscape gardening. Due to the wood being very dense,.. The tanalised softwood brown sleepers are becoming increasingly popular. These sleepers are ideal fo.. The tanalised softwood green sleepers are becoming increasingly popular. These sleepers are ideal fo..